A new gallery has opened in Daejeon, run by a local group of expat artists. The Daejeon Artists’ Collective has been running exhibitions since 2011, but made the plunge late last year to open a small gallery near the city’s Junggu Office Metro Station. 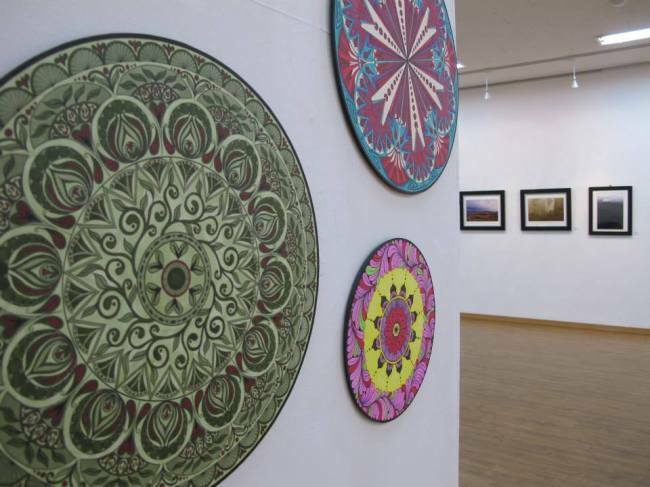 The DAC held a group exhibition there in December, and has begun this year’s series of solo exhibitions with a collection of mandala paintings by Rika Scholtz. DAC member Rosalie Knaack explained that the paintings were based on the mandala paintings created by Buddhist monks for meditation. “They pour colored sand and spend days and weeks making beautiful patterns, and then just sweep it away,” she said, explaining that Scholtz did hers in paint and ink. The group intends to allow its members to take turns exhibiting, but could also consider artists from other cities. Members work in a wide range of genres, from conceptual art and paper-cutting to paint and photography, and exhibitors at the gallery will also run workshops on their crafts. “All of our members have skills and people in the community might be interested in learning about them and what they are doing,” said Knaack. Knaack is currently balancing her university teaching job with studying for a master’s in ceramic art. But she has credited the Daejeon Citizen’s College for giving her a creative outlet when she lacked musical opportunities. “It’s a really good way of meeting local people and it’s a wonderful resource for everyone in Daejeon but especially (people like) us,” she said, explaining that it allowed her to meet people outside of the context of her job. She said the college had introduced her to ceramics, while other DAC members had studied other fields and even gone on to university-level study. The DAC is open to new members through a democratic process, with artists admitted according to a majority vote. The main requirements are that the work must be good enough to exhibit and members must share the cost and workload of putting on exhibitions. Knaack said applications should come with a selection of work, but not necessarily a professional portfolio. For more information on the group or the gallery, visit gallerydac.com.